Un superbement meublé appartement penthouse 1 chambre qui est situé dans le complexe Predela luxueux. Predela vante de belles vues sur les sommets des montagnes Rila et Pirin et les crêtes qui peut être apprécié à partir d'un grand balcon qui longe les locaux avec une vue imprenable au nord-est. Chauffage central et radiateurs sont montés dans chaque chambre. Le complexe dispose d'excellentes installations de loisirs. Les installations sur place comprennent: sécurité 24h / 24, conciergerie à la réception, deux ascenseurs pour accéder facilement à tous les étages, piscine couverte avec toit en verre, jacuzzi, sauna, salle de jeux avec table de ping-pong et billard ainsi qu'un café boutique. Dehors: Un toit en verre piscine intérieure, jacuzzi, sauna, tennis de table et une table de billard ainsi que d'un café sont disponibles en bas. Service de nettoyage / serviettes / / Femme de ménage: Tous les draps et serviettes sont fournis changés chaque semaine. Autres: Petite salle idéale pour le stockage des bagages / de ski. Une connexion Wi-Fi disponible. 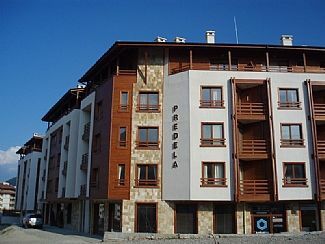 The Predela complex is conveniently located very near to the ski lift and a short walk to the shops, restaurants and bars and the old town. It has a decent indoor pool. This is a very nice spacious apartment which is light due to the nice big windows. We found it to be clean and well appointed. Overall we were very pleased with our stay there, and would be happy to stay again or recommend it. A great property in a great location . A great property in a fantastic location , 2 minute walk max to gondala and all shops and bars . Complex has a great free pool and steam room all in the price . Thank you so much for a fantastic stay in this great apartment. We found it to be very well equipped and exactly as described and spotlessly clean, very spacious for a one bedroom apartment with a large balcony with mountain views and a room for ski storage. Excellent on site pool & spa facilities, games room with pool table & table tennis. The staff are very friendly and the reception is manned 24 hours, we arrived early hours of the morning and had no problem accessing the apartment. The location was brilliant, close to the gondola station and nearby to the town for a full variety of restaurants and amenities (We loved Bears for hot cocktails and The House is a great place to eat). I would highly recommend this property and will definitely be using it again. We stayed in Aprt 60 of Predela 1. This is the second time we have stayed here. Easy access to the town and gondala with a little supermarket underneath. Lots of lovely traditional restaurants in walking distance. The lid on the kettle was broken when we arrived in the earlie hours of Sunday morning and by Monday morning, a new one had been delivered. The light bulb went in the bathroom and it was changed immediately. We had a great time and we will be back. 5. Good size, great views and safe. We had no problems during our stay. Les installations sur place incluent un service de sécurité 24h / 24, un concierge à la réception, deux ascenseurs pour un accès facile à tous les étages, une piscine intérieure sous toit en verre, un jacuzzi, un sauna, des tables de ping-pong et de billard, ainsi qu'un café. Vous pouvez aussi aller à Plovdiv, qui est un peu plus loin. * Vols Heathrow à destination de Sofia www. British Airways. com propose de très bonnes affaires. * Vol uniquement avec www. balkanholidays. co. uk de / vers divers aéroports. La vieille ville de Bansko est à distance de marche, ce qui a un certain caractère avec certains magasins, restaurants et cafés. Booking Notes: On booking £100 non-refundable deposit is required. Full balance will be required 8 weeks before arrival. The booking will be co-ordinated by our rental agent in Bansko, who are also on hand to provide you with any local assistance / advice. Changeover Day: We are very flexible with changeover days, arrival and departure times.